Keston Hiura made his first Southern League homer one for the ages. Milwaukee's top prospect belted a walk-off solo shot in the ninth inning to cap off a three-hit day and lead Biloxi to a 6-5 win over Mississippi at MGM Park on Wednesday night. "It was just the same great feeling as my one earlier in the season [for Carolina on May 25]," Hiura said. "Just to see the whole team there surrounding home plate, especially with us in the playoff race right now, it was definitely a great feeling." Promoted from Class A Advanced Carolina two weeks ago, the ninth overall pick in last year's Draft had been crushing Southern League pitching in all categories except homers going into his 12th game at the Double-A level. Heading into his team's opener with Mississippi, Hiura had batted .341/.400/.463 with five doubles and hits in nine of his first 11 games. "Everything's more crisp and played at a little bit faster pace and played a little bit more cleanly," he said. "A lot of people know what they're doing, and they're pretty good at commanding their pitches, getting the spot they want. For the most part, pitchers are around the zone. They're more careful with what they're throwing you, but in the end, it's the same game. I'm just going with my same approach that I've always had." Hiura's hot offensive beat continued in the third inning with his second at-bat of the night. The second baseman laced a double to center field, driving home the Shuckers' first run. Baseball's No. 48 overall prospect followed with a leadoff single to center in the sixth, scoring on Trent Grisham's single to right. After Hiura worked a walk in the seventh, Mississippi put three runs on the board in the top of the eighth and Biloxi responded in kind. Hiura led off in the bottom of the ninth. "The eighth inning was huge for us," he said. "Clint Coulter came up and had a bases-clearing triple to tie the game, and that was great for us. I was just hoping to keep the momentum going into the ninth. [Shuckers reliever Nate Griep] threw a great top of the ninth inning. I knew I was leading off, so I was just looking for a fastball and trying to drive it, hit it hard, get on second base or in scoring position and give a chance for the team to win." The UC Irvine product worked the count to 2-1 against Mississippi reliever Chad Sobotka before depositing his offering beyond the left-field wall. The blast was Hiura's first since a two-homer performance in his final game in Class A Advanced on May 31. "He threw all fastballs the whole at-bat," he said. "The first two pitches were balls, and the 2-0 pitch, I took a pretty healthy hack at it and ended up swinging and missing. The inning before when he was pitching, he didn't throw too many offspeed pitches, so I was thinking he was going to work off of his fastball. He just happened to throw one not necessarily in my zone, but I was just ready for it and put good wood on it." The win, coupled with a Mobile loss that Hiura and his teammates watched in the clubhouse postgame, dropped Biloxi's magic number to two to clinch the Southern League South first-half title with four games left to play. 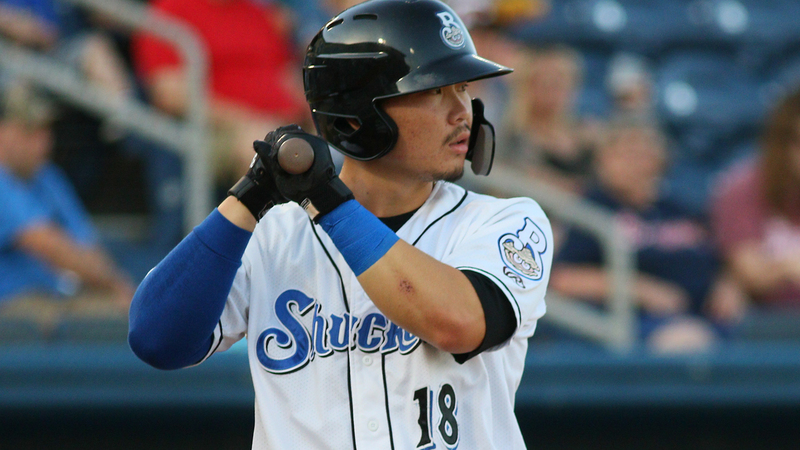 "I think we're one of the scariest lineups in Minor League Baseball right now," Hiura said. "I mean 1-9, there are hitters that always can hit the ball hard and all have power potential. I think it's definitely intimidating for the other team to see. We're all confident that if one guy can't get the job done, then the next guy is just as capable of doing it. "It's been really cool. We have a great group of players here, really talented -- as you can see -- with the amount of top prospects on this team and all that. It's definitely cool to be a part of it and contribute any way possible to help win games."